In order to provide an adequate basis for its teaching and dissemination activities, the CAPAZ will provide an institutional framework for individual and cooperative research. During the developmental phase, the Institute will itself conduct explorative studies for its future work. In addition, it will support Colombian researchers in applications for funding. Dealing with the Past: Transitional Justice. 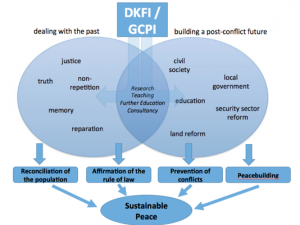 Building a Post-Conflict Future: Sustainable Peace. Since 2012, the Colombian Government and the Fuerzas Armadas Revolucionarias de Colombia (FARC) have been negotiating an end to the non-international armed conflict, reaching an agreement in June 2016. The conflict has caused enormous numbers of victims, mostly in rural areas. Thus, governmental as well as civil society actors are faced with huge challenges in promoting a peaceful future. The current peace process aims at dealing with the main causes of the conflict with a special focus on the victims who have actively participated in this peace process. Aiming to prosecute different responsible actors and taking into account lessons learned from former peace processes. The international community has been involved via advice, support and the monitoring of the process. The multitude of challenges requires further research, knowledge production, dissemination and education. All topics will be discussed and elaborated jointly by Colombian and German partners. The Alliance of Universities for Peace includes some of the best researchers and experts in the country. Researchers located in the affected areas will complement this expertise.